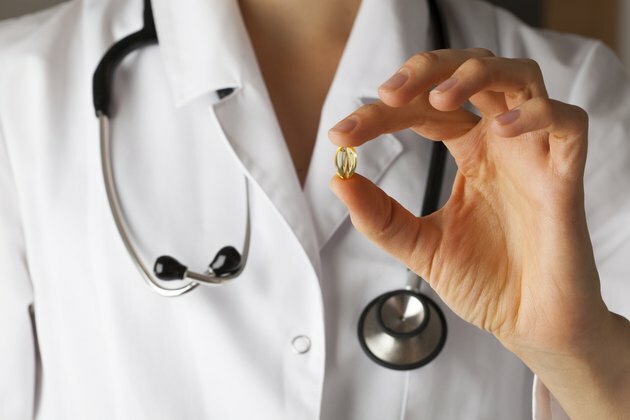 Does Omega 3 Fish Oil Thin Your Blood? One of fish oil's main side effects is thinning of the body's blood, which can be both positive and negative. The highly consumed supplement is primarily taken for cardiovascular benefits, according to the University of Maryland Medical Center. Because fish oil decreases the time your blood clots, it is important to discuss taking the supplement with a medical doctor. Fish oil is made up of omega-3 essential fatty acids. Normally, blood platelets' sticky surface causes blood to form together and clot. Fish oil supplements decrease blood platelet activity, resulting in slower blood clotting and thinner blood. Blood clots might form in the body's arteries, leading to blocked blood flow and oxygen. Fish oil decreases the amount of dangerous blood clots forming, lessening your risk of heart attack and stroke. According to MayoClinic.com, low doses of fish oil are rarely associated with dangerous side effects of blood thinning. The website suggests taking no more than 3 g of fish oil. If you are taking more than 3 g of fish oil, do so only under a physician's care. When taking large doses of fish oil, you increase the risk of a hemorrhagic stroke occurring when blood vessels in the brain rupture, leading to internal bleeding. Oxygen no longer reaches the brain, causing brain damage, paralysis and possibly death. Blood thinning because of fish oil might cause nosebleeds, blood in the urine, bleeding gums and skin bruising. Still, theses side effects are rarely medical emergencies. If the bleeding does not stop or the area becomes increasingly painful, seek immediate medical attention. If you are taking additional blood thinners, known as anticoagulants or antiplatelet medication, take extreme caution when adding fish oil supplements to the mix. These medications might include warfarin, heparin, aspirin and clopidogrel. Other supplements also have blood-thinning capabilities. Do not combine fish oil supplements with these supplements without talking to your medical doctor. These supplements include ginkgo, garlic capsules, red clover and even oregano. Does Garlic Thin the Blood?